After the week of The Fete Nationale de Monaco which for it Akris has created the whole wardrobe for Princess Charlene (you can see the looks here), she attended few other events wearing Non-Akris clothes. Costum Akris dress, I just love the lace details, the texture, and the fact that it's more silver than gray. She paired it with the Harper Coat from Ralph Lauren. 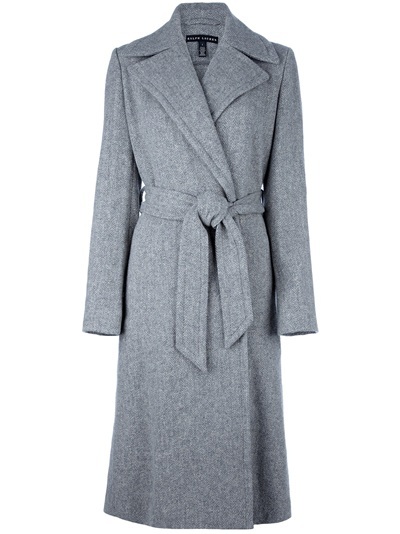 Grey merino 'Harper' coat from Ralph Lauren featuring notched lapels, a belted waist and long sleeves. I LOVE this look, her makeup was perfect, and she was wearing some jewels! On November 25th The Princess accompanied Prince Albert to attend the centenary commemoration of the Saint Charles church's dedication in Monaco. For this engagement Princess Charlene wore a black half-sleeved dress, black tights, burgundy scarf, black and brown boots, and her trusty Louis Vuitton clutch. I think the scarf might be Louis Vuitton too. While Charlene's dress is too simple/boring/blah to be identified, Her boots were worth the effort. She wore the Sabella II Two-Tone Riding Boots from Ralph Lauren. 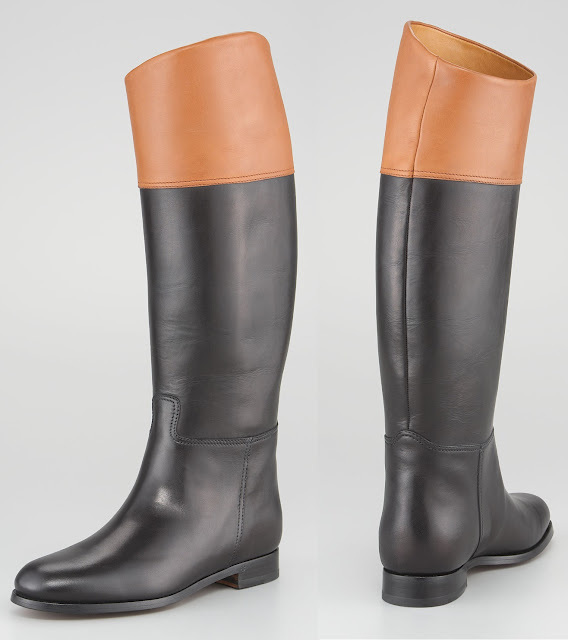 Timely and timeless, this Ralph Lauren knee boot sports on-trend colorblock in a classic equestrian style. Approx. 16" overall boot height. And earlier that day the Princess attended the closing the 13th 'No Finish Line' charity 'run' in aid of charities for children, wearing a not so fashionable but definitely occasion-appropriate outfit. She looks cool in orange! A reminder: Charlene's Ralph Lauren golden evening gown that she wore for the Ritz Carlton gala in Montreal last month, called Langley Crinkled Halter Dress is now on sale of the Ralph Lauren website, marked down from $1498 to $899. That's a good deal for a royal Ralph Lauren dress. Honestly, I like that Her Serene Highness is now dealing with more designer and trying new things, makeup and stuff, her style is definitely evolving! At least something is evolving! I've never had too many nice things to say about Charlene's fashions, but that is all changing. She has come a LONG way! I think that haircut is fabulous and she's been choosing clothes that both flatter her figure and are colorful enough to flatter her coloring. I wonder if she's been using a stylist? Charlene is the best dressed new Princess,imo. She usually always looks flawless. I prefer her style over Kate's which sometimes looks unkempt. Charlene looking beautiful and gorgeous in the first outfit and coat. Great post! She looks great in grey! It suits her a lot. I don't think she has any radiance, so no matter what she wears, it always looks blah. The clothes however look beautiful on their own.